The holding cabinets have externally mounted thermometers on the doors to easily monitor food holding temperatures. Sneeze guard meets food preparation requirements for height and length. Optional hand sink cart makes hand washing convenient. Flexible serving options allows top to hold 4 or 6 full size (12" x 20" x 6") food pans. Large storage capacity with two hot or cold holding cabinets. Also one dry goods storage area includes a lockable cash drawer to safely keep money and valuables. Easy Transporting and docking with molded-in handles and four 6" swivel casters. Two of the caster lock for easy docking on each module. How about a sandwich at half time or a snack on the 10th tee. Just add food and start earning profits in non-traditional locations. The two compartment hand sink runs both hot and cold water. Will satisfy most Health Department requirements nationwide. 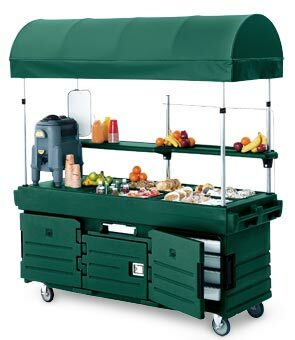 Made of durable polyethylene, the carts are lightweight and won't dent, crack, bubble, chip or break. They are easy to clean-just wipe them off. The CamKiosk® holds a surprising amount of food. With special thick foam insulation, food temperatures are maintained. 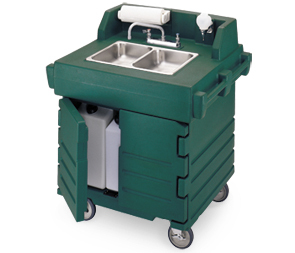 The Portable Sink Cart hosts a two compartment stainless steel sink and runs cold water and hot water up to 140° F. The two 5 gallon fresh water tanks and 7-1/2 gallon refuse tanks provide approximately 70 hand washings. The tanks are easy to insert or remove for emptying and refilling. The hot water heater has a 2-1/2 gallon capacity and heats water in 10 minutes. A common 110 volt wall outlet is required. Paper towel holder and soap dispenser are included. Water pump is NSF listed. Water pump and water heater are UL approved. Water heater and water pump draw a maximum of 11.25 amps and 0.7 amps, respectively. The hand sink cart's electrical system runs on an average 10 amps.